Multnomah County Office of Sustainability together with the Green Team has started the Multnomah County Sustainability Film Series, with films and panel discussions at Bagdad Theatre on a quarterly basis. The films, or rather documentaries, are all related to topics of concern to sustainable development. The event I attended on 17 October 2010 focused on the issue of water supply; locally, globally, sustainably. 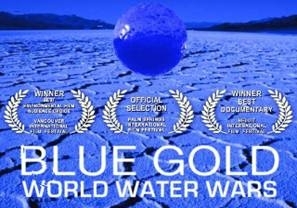 The film shown was “Blue Gold: World Water Wars” (2008) by Sam Bozzo , narrated by Malcolm McDowell, is an informative work of art that, which for the most part, paints a dire picture of our fresh water supply—present and future. As any work of art, including documentaries, Blue Gold is clearly geared toward raising public awareness of the economic and political facts behind the current fresh water supply situation and getting private persons in motion to defend against corporate robbery of this precious natural resource. The film includes interviews with scholars, authors, government officials, corporate representatives, and NGO representatives as well as facts and statistics on the relevant ecology. It starts off with the story of Pablo Valencio and the description of what real thirst, i.e. being without water for seven days, is like. The horrific agony described, e.g. “crying blood” sets the mood right away. Then, the film highlights different aspects surrounding the world water supply, such as global economics, powerful corporations, and other contributing factors like agriculture and urbanization. Some of it may seem overly dramatic, e.g. 60% of wetlands polluted in the last 100 years, or the pumping of ground water at a rate 15 times higher than is being returned back into the ground, but it is all fact based. The point is made that not so long ago water started to be seen, talked about and traded as a commodity, and that we (the public and politicians) need to make sure it is gets back into public hands. Advocates are fighting for the “right to water” to be acknowledged in state regulations. There are examples of citizens fighting, e.g. in Bolivia, Kenya, and the U.S. against corporate oppression and overpriced water, and some of them with success. There actually have been physical fights over water, with citizens, e.g. in Bolivia and South Korea leaving their lives to make their governments reverse privatization contracts over water. At the end of the film, however, an alternative scenario is provided, with a way of saving rain water, using permeable pavements, decommissioning water dams, and changing to local food and water supply, ultimately preventing water wars. And then, just when you think there is hope again and the film is going to leave you with some positive thoughts, the last minute or so is dedicated to the memories of people who have fought for public access to fresh water and left their lives for the cause or because of the lack of water availability, all accompanied by somber music. I highly recommend watching this film, and having tissues at hand while doing so. The subsequent panel discussion was not very lively or long. There were three guests; a policy advisor from the Multnomah County Health Department, a Northwest organizer for Food and Water Watch, and PSU Professor Catherine Howells, an expert on local water policy and environmental impacts. There were a few questions from the audience related, e.g. to water testing and purity standards, Portland’s water system, or ways to promote tap water vs. bottled water use. Even though the main event was the film, the organizers did a good job of tying it in with peripheral activities, such as a tap water vs. bottled water tasting test and collecting signatures for a protest against allowing a Nestle water bottle facility at Cascade Locks. The next event in the series will be a showing of the film “Food Fight” at the end of January 2011. Go see and participate! For another review of this film, see Chandler Patton’s write-up on the blog “Eve’s Ale,” “Documentary Review #2: Blue Gold,” Oct. 28, 2010. For more on Catherine Howells, see “Oregon Experience: Bull Run” and Nikole Hannah-Jones, “Multnomah County becomes first in Oregon to ban bottled water from functions,” Oregonian, Oct. 14 2010. Wow! This documentary sounds amazing! I really enjoy watching documentaries on a variety of subjects and I am surprised I have have not heard about this documentary until not. Water right and water related issues are going to be one of the major issues that our generation is going to have to deal with. Currently, on the horn of Africa, the lack of water there is causing major problems for so many people. The statistic I recently read was 24 thousand children under five have died due to the drought in Somalia and other countries. The problem that have arisen due to the lack of water are incredible. We treat water as if it is an endless resource. There is no way we can continue to use water in such wasteful ways!